AKG C214 vs RODE NT2A: Which is the Best Condenser Mic for Voiceover? In this article, we’ll discuss two distinct condenser microphones that you should consider: the AKG C214 and the Rode NT2A. Both microphones have a plethora of exquisite features that make them unique. AKG C214 and Rode NT2A are the superb condenser microphones available in the market today which are used mainly for voiceovers. Every recording artiste desires to have his/her music heard by millions of music lovers worldwide. The intrinsic urge to share your impressive vocal talents can easily be stifled by the unfortunate lack of top-quality equipment that can accurately reproduce your natural sound. When shopping for a good microphone, always opt for a top of the range condenser mic. For instance, the AKG C214 mic has a large, 1-inch diaphragm that sports a freely vibrating membrane to offer a smoother frequency response and optimal transient detail. The Rode NT2A condenser mic, on the other hand, offers an impressive on-body polar pattern control feature. This means that you can shift between the Omni, Cardioid or Figure 8 polar patterns by simply flicking a switch that’s conveniently located on the mic. You’ll also marvel at its ultra-low noise feature. Interestingly, both mics are engineered and manufactured by two revered companies: AKG Acoustics and Rode. These two giants have an impressive track record for designing top-quality audio equipment using an assortment of technologies. The AKG C214 boasts of having a rugged, all-metal body and roadworthy construction. A sturdy capsule suspension is included in the accessories – it helps to diminish unwanted resonances and mechanical noise for better vocal clarity and sonic accuracy. The mics double mesh head grille offers ample capsule protection to ensure that optimum acoustic performance is maintained. The Rode NT2A, on the other hand, features a sleek design and comes in a variety of colors, including black and nickel. Its large gold-sputtered capsule is protected by an all-metal head grille, giving it a rugged look. This condenser mic comes with an SM6 shock mount, a dust cover and a pop filter – all these accessories are top-notch. As an additional bonus, you’re offered a downloadable video that offers crucial tips and instructions on different recording techniques. When it comes to their weight and dimensions, the AKG C214 and Rode NT2A are starkly different. The AKG microphone weighs 3.15 pounds and its dimensions are 11.3 x 8.6 x 3.9 inches. The Rode NT2A weighs 6 pounds and measures 15.5 x 5 x 11.2 inches. Clearly, the AKG C214 condenser mic is considerably lighter and more compact compared to the Rode microphone. Both mics come with several accompanying accessories. The C214 package includes a spider-type shock mount, a windscreen, and a versatile carrying case. 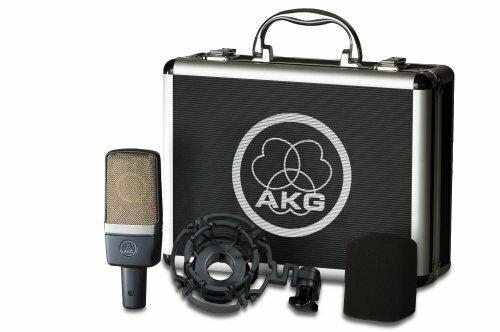 AKG offers a warranty of one year for its C214 condenser mic. The Rode microphone comes with a shock mount, a convenient dust cover, cable, and instructional DVD. You get a full 10-year warranty upon purchasing this mic and registering it for free on the Rode website. This is quite impressive considering that most warranties rarely cover such a lengthy period. The most outstanding feature of the AKG C214 is its large diaphragm sound. This condenser mic is able to handle up to 143 dB dynamic range, thanks to its one-inch diaphragm that vibrates freely to offer high transient detail and a wide, smooth frequency. The Rode NT2A also sports a large diaphragm – it’s designed using a professional one-inch capsule. The AKG C214 is designed for superior onstage performance and close-up miking. It has a switchable 20dB attenuation pad as well as a low cut filter, making it perfect for overly loud applications such as high-output bass sounds and drum overheads. The Rode NT2A, on the other hand, has a superior frequency and transient response that’s optimized for modern studio recording techniques. The AKG C214 has a rugged, roadworthy construction. Its integrated capsule suspension effectively lowers resonances and mechanical noise to produce clear sound with enhanced sonic accuracy. This condenser mic also sports an all-metal double mesh grille that guards the interior capsule and guarantees high radio frequency immunity. 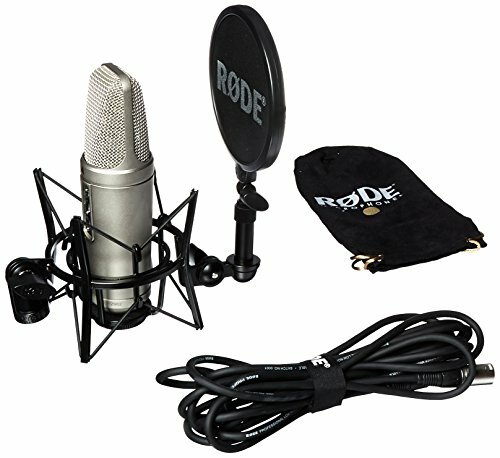 The Rode microphone also features solid metal construction – the package features an SM6 shock mount, mic cable, and a dust cover. The AKG C214 also features a cardioid polar pattern that effectively suppresses unwanted sounds emanating from the microphone’s rear end. This allows it to render a beautiful reproduction of solo instruments and lead vocals. The Rode NT2A delivers a variable three position polar pattern that includes the Omni, Cardioid and the Figure 8 patterns. This feature, coupled with its high pass filter switches, makes it an exquisite condenser mic for studio recording. AKG Acoustics is an Austrian company that engineers and manufactures high-quality audio equipment. 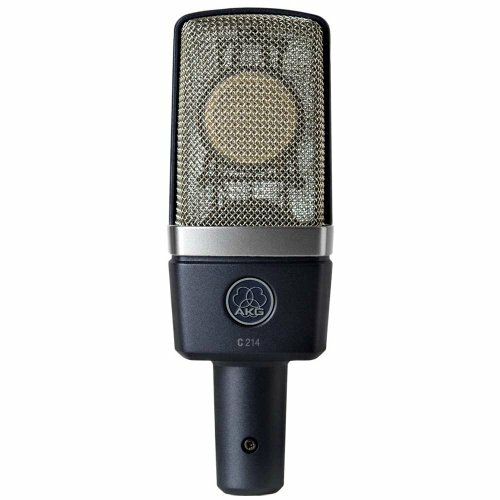 AKG is especially revered for its legendary mics, including the C214 condenser microphone. It features a fixed cardioid pattern that attenuates any noise originating from behind the mic. The sound quality delivered by the AKG C214 is phenomenal. It delivers crisp-clear vocals and amplifies sound to offer life-like transients, thanks to its large diaphragm. Whether you’re using it for onstage vocal performances or for broadcasting, the AKG C214 delivers impressive sonic accuracy and a highly detailed sound. As one buyer puts it, “it works well on everything”. Rode is a well-respected audio manufacturing company situated in Sydney, Australia. It engineers top range audio equipment for an assortment of worldwide clientele, setting the bar high in terms of sound quality. The Rode NT2A delivers amazing sound that certainly lives up to the Rode legacy. This mic features three switchable polar pattern positions (Omni, Cardioid and Figure 8) as well as three unique High-Pass filters (Flat, 40 Hz and 80 Hz). You can easily switch between these different functions to produce the perfect vocals for your studio recording sessions. You can even switch between three different PAD adjustments that include 0 dB, -5dB and -10 dB. Clearly, this condenser mic offers much more flexibility and freedom. The Rode NT2A mic is exceptionally versatile, thanks to its unmatched audio characteristics. AKG C214 comes with a bass-cut filter for close-up recording while NT2A comes with a low cut filter. Delivers a warm, natural sound with exceptional fidelity, thanks to its dynamic range and switchable attenuation. It’s perfect for onstage performances. It offers ultra-low noise that’s perfect for close-up studio recording. Delivers exquisite reproduction of brass and other musical instruments, helping to deliver natural acoustic sounds that capture every nuance. Double mess grill surrounding the capsule serves several purposes to maintain optimal RF immunity. C214 microphone’s cardioid polar pattern ensures that noise emanating from the rear is effectively attenuated to offer superior sound quality. Provides more freedom to switch between three distinct position polar patterns, PAD, and High-Pass Filters. This makes it an extremely versatile condenser mic. Delivers exquisite sound quality for a wide range of vocals, especially for female voices. Features solid construction and delivers balanced vocal ranges, thanks to its amazing frequency and transient response. Rode offers a remarkable 10-year warranty for its NT2A version upon registering your purchase online. It comes with a variety of accessories, including the SM6 shock mount and a lovely dust cover. 1. AKG C214 vs Audio-Technica AT4040- Let's Settle This! After scrutinizing the AKG C214 vs Rode NT2A, it’s hard to select a winner between the two. After all, both have remarkable features that allow them to stand out distinctly. AKG C214 delivers an excellent dynamic vocal range and attenuates noise quite efficiently, making it perfect for close-up recording. 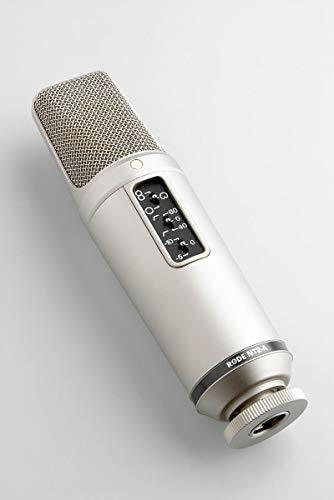 In addition, this mic is constructed using versatile, roadworthy materials that guarantee superior sonic accuracy while significantly reducing mechanical voice. It’s perfect for onstage performances and roadshows. The Rode NT2A, on the other hand, offers superlative audio characteristics. First, you can choose between three PAD positions (0dB, -5dB or -10dB). You also get the freedom to vary between the three-position polar patterns as well as the three-position filter. These flexible features, coupled by the mic’s ultra-low noise, make the Rode NT2A a perfect addition to your studio collection. It’s ideal for a modern studio recording. Overall, the Rode NT2A takes the day. It has cool features and a sleek, modern design. In addition, it reproduces vocals and instrumentals superbly, helping singers to improve their voices while suppressing any ‘pops’ and ‘clicks’ and that might ruin their rendition.